The Haltbar M42 701 series bandsaw blade will cut through applications that the 601 series blade cannot. The 701 series is designed to cut Inconel, D2, Monel, and other exotic alloys. The unique tooth geometry, plus the addition of an 8% cobalt backing strip, helps to assure prolonged blade life even under constant feed pressure. The 701 series bandsaw blade is good for production cutting of stock bars and solid rounds, and is recommended for applications that are prone to work hardening. The 701 series variable tooth height and set make this a high performance bandsaw blade that allows for an aggressive surge cutting action. The Haltbar 601 series is designed for general purpose and contour cutting of stainless steels and nickel-based alloys of up to 45 HRc (Rockwell Hardness Scale). Aside from solids and stock bars, this blade can also be used to cut in a wide variety of applications including structural steels, tool steels, pipes, and tubes. Because the 601 series can be used on such a broad range of materials, it comes in a wider range of tooth pitches depending on blade size. Both the 701 and 601 series of bandsaw blade are design for faster cutting rates, better cut finishes, and longer blade life. Choosing the right bandsaw blade for the best possible productivity and output is easy if knowledge of blades and materials is keen. 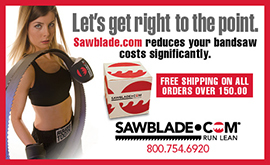 Visit SawBlade.com to find out more. This entry was posted in All Posts and tagged #bandsaws, #SawBlades, 601 series, 701 Series, alloys, Bandsaw, blades, Haltbar, Haltbar Sagen, M42, machinists, sawblade.com, steels, woodworkers. Bookmark the permalink.